British Envoys To Germany 1816-1866: Volume 3: 1848-1850: 1848-1850 V. 3 (Camden Fifth Series)(Vol.3 Only): 9780521872522 Hardcover - LIMEROCK BOOKS INC. This edition presents official reports sent by British diplomats stationed in Germany to the Foreign Office in London. 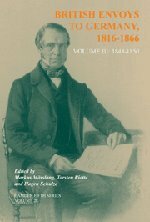 The diplomatic correspondence of the years 1848 to 1850 vividly illustrates the importance of the 1848 Revolution and its aftermath as an epoch-making event in German and European history. It reveals the attitude and perceptions of British observers in a period of great diplomatic activity and vigilance. The developments and changing political situation between the outbreak of the Revolution and the start of the Dresden Conferences in late 1850 are reflected by the official British observers at the level both of the individual member status of the Confederation and of Germany as a whole. This edition presents official reports sent by British diplomats stationed in Germany to the Foreign Office in London. It vividly illustrates the importance of the 1848 Revolution and its aftermath as an epoch-making event in German and European history and reveals the attitude and perceptions of British observers.